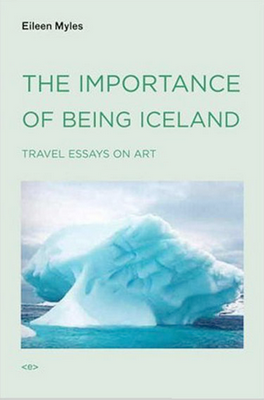 Eileen Myles’ The Importance of Being Iceland: Travel Essays in Art begins with travels in Iceland. Myles writes about her own writing and research on art and culture in the little island country. From there, it moves in any number of ways, yet always comes back to an affirmation of life for all of its complications and trials. Myles is an intensely alive and proud woman, lesbian, and artist with a widely varied and beautiful personal history. She ran for president in 1992, lived in a box in Manhattan for a week, was close friends with Allen Ginsberg, and has been lauded as a post-punk and modern poetry hero. Many parts of The Importance of Being Iceland are written in long, fluid, stream of consciousness paragraphs. The writing is lyrical and smooth while also unsettling. Whenever I’d been reading the book for more than twenty minutes at a time, I felt like I was emerging from a dream. Included in the book is an interview with Daniel Day-Lewis, an actor well known for his intense need to dive into a role and be in character constantly during a shoot. The two seemed well-suited to each other. Myles seems to live life with an intensity and awareness that others can’t or perhaps don’t. We hear about her time with a therapist, with lovers, and with family, but it is not a memoir in any traditional sense of the word. She discusses art, poetry, literature, and beauty, though it is not a set of critical essays. The book has an intense amount of detail and incredible storytelling. Life and its varied experiences (including a Björk concert, flossing your teeth, and menopause) are examined and celebrated. The Importance of Being Iceland is profound and passionate. We are never forced to think a certain way about anything; Myles simply introduces us to her way of thinking and details her reasoning for why she thinks that way.